The Halo community was stunned as the Green Wall was dismantled. The best team in competitive Halo was dethroned this weekend as Splyce defeated two-time world champions OpTic Gaming in the grand finals at DreamHack Atlanta. 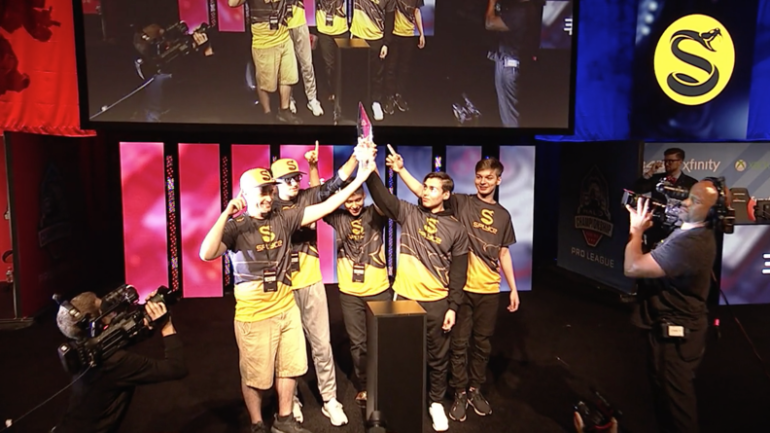 Splyce—Jesse “bubu dubu” Moeller, Ryan “Shooter” Sondhi, Jonathan “Renegade” Willette, and Anthony “Shotzzy” Cuevas-Castro—kicked off Sunday’s action with a shocking 4-1 win over the Green Wall in the winners bracket finals. OpTic was sent down to the losers bracket, where they squared off against Team EnVyUs after the boys in blue started an impressive losers bracket run. But the Green Wall proved to be too strong for the boys in blue, and OpTic swept EnVyUs 4-0 to get their shot at redemption against Splyce in the grand finals. The grand finals was a back-and-forth matchup until the very end. OpTic opened up the series with a 100-36 win on Plaza Strongholds, but Splyce responded with a 50-44 victory on The Rig Slayer. The Green Wall took the following map, Capture the Flag on Fathom, but Splyce bounced back again with a 100-71 win on Eden Strongholds. With the series knotted up at two maps each, Splyce broke the tie with a 50-41 victory on Truth Slayer. Now on match point, the grand finals transitioned to Capture the Flag on Coliseum, which turned out to be a battle to the very end. Splyce earned an early 2-1 advantage, but OpTic kept the pressure up and tied the game at two captures each. The game eventually went to overtime, but Splyce punched the winning flag cap in 11 seconds later to secure the 4-2 series win and the DreamHack Atlanta championship. Not many squads have been able to take down OpTic’s Halo team recently, but Splyce defeated them twice in the same tournament, which has to make this championship that much more meaningful for this roster. For OpTic, this is their second straight second-place finish at a Halo tournament, following their silver medal performance at UMG Daytona in May. It’ll be interesting to see what OpTic needs to do to get back on top of the competitive Halo scene.